I stumbled across this gelato shop on Facebook awhile back, and I was first drawn to its location. Nestled within the HDB estates of Bedok, I was extremely elated at its proximity. Finally somewhere claiming decent gelato around the East! Yet I felt a little worried for the shop. With that many artisan ice cream shops setting up over the island (30 gelatarias by Time Out Singapore’s last count a year back), would they be able to secure a loyal customer base in a heartland location? With so many alternatives what does it take for them to stand out? A month and over 7 visits later, gone are my initial doubts. 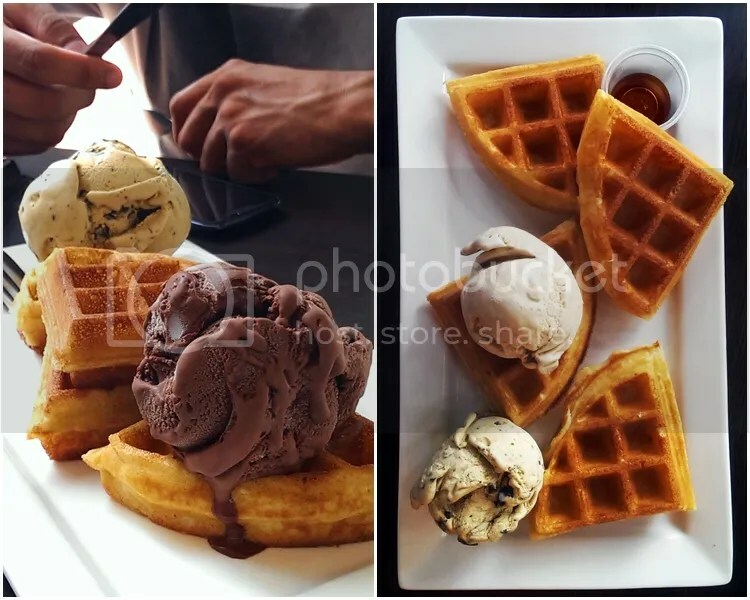 Milk and Honey Gelato serves – hands down – one of the best gelatos and waffles on the island. 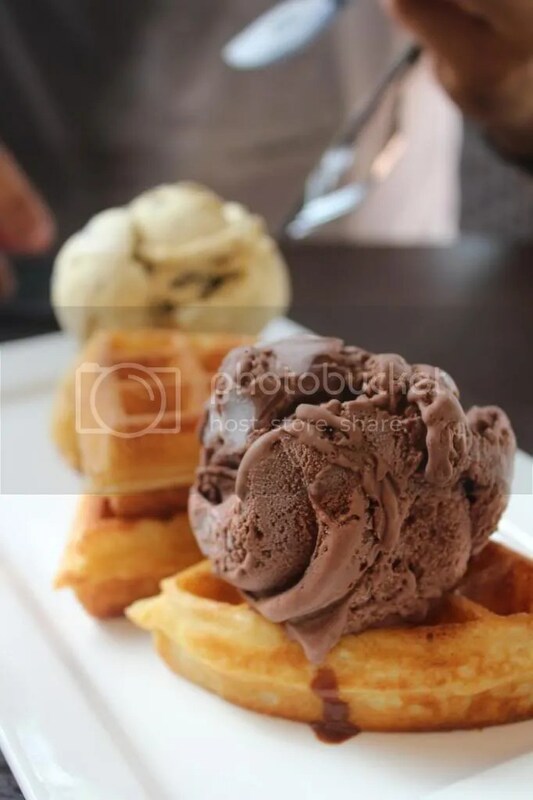 You can’t pit them against the big shots like Gelatissimo and Gelataria Italia who boasts a variety of flavours; but looking at the selection and quality of what they offer, Milk and Honey Gelato is indeed a force to be reckoned with. I love how M&H has this Buddy Meal ($9) consisting of 2 scoops of gelato, a waffle, and a lemonade. First off they make a mean waffle. 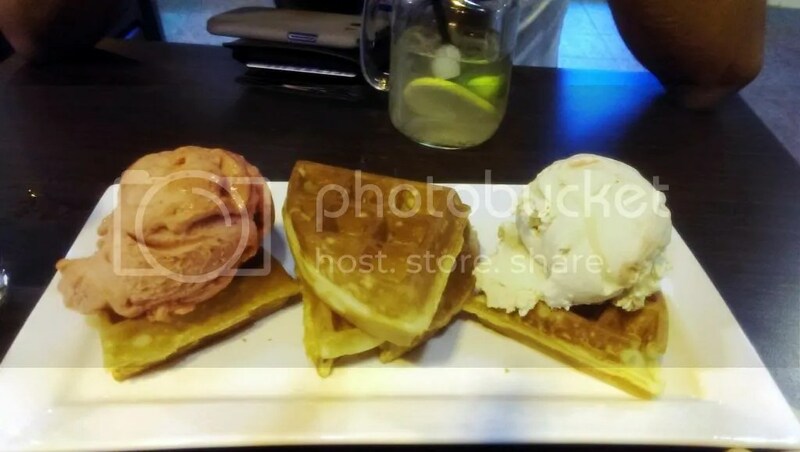 Crisp on the outside but absolutely fluffy on the inside, M&H’s waffles are probably the best I’ve had in Singapore. Soaked in the goodness of the accompanying melted gelato, each bite is a burst of flavours and contrasting textures. An absolute delight. Grandulia is essentially a gelati-fied version of a Ferarro Rocher. Rich and chocolatey with a slight hazelnut aftertaste, this is a favourite among customers. It was well-executed, but I thought there was no oomph factor distinguishing it from its countless Rocher counterparts. Decent but not outstanding. The Irish Latte on the other hand is a clear winner. The intense fragrance of the coffee cuts through in every bite, yet is pleasantly rounded off with a milky flavour. I loved it from the very first bite. And what’s best is that it goes well with every other flavour, bringing a freshness to the pairing. Shy Green Nut’s a new flavour launched about 2 weeks back. Essentially pistachio-flavoured gelato mixed with specks of chocolate chips, unique is probably the best word to describe it. I love that they absolutely nailed the nuttiness, but the numerous chunks of chocolate chips overwhelmed the subtle nutty pistachio flavour. It ended up being more like a chocolate chip gelato. A few days ago I decided to give it another shot, and I’m glad that they took our feedback and cut down on the chocolate chips! The chocolatey taste was still pretty strong, but at least there’s a distinct pistachio flavour to it. 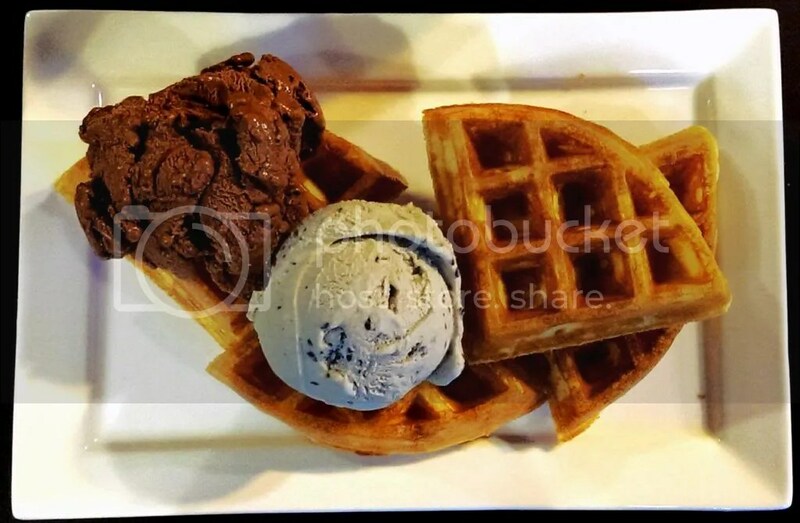 We were introduced to their signature flavour, the Choc-a-Baby, on our very first visit. Deep, dark, and intensely chocolatey, this is any dark chocolate lover’s ultimatum. Though it is indeed wonderful, there are many gelataria offering really good dark chocolate gelatos (for example the amazing dark choc series exclusively available at Lido’s Gelatissimo) so I’d say save your tummy space for the other more special flavours. One being the Black Beauty. I. Love. Black. Sesame. Ice. Cream. Have I told you I love black sesame ice cream? Imma say it again I absolutely ADORE black sesame ice cream. And M&H blew me over with theirs. I’ve tried black sesame ice creams/gelatos everywhere I saw them, and this is hands down one of the best I’ve had. It stands out because of that subtle roasted seeds aroma that comes out from the gelato. Somewhat like how sencha would compare against matcha. If there’s one flavour that’ll keep me coming back, it’s this. It’s a MUST-TRY. Even if you’re a hater. You never know if this would be the turning point in your life. Do try it soon .as this is one of their special flavours that’s only made periodically. Balsamic Strawberry and Salty Malty. Pardon the horrendous photos these were from my phone with really bad lighting! If there ever were two flavours that were made for each other, it’s these. The Balsamic Strawberry and Salty Malty are simply a match made in heaven. The peeps at M&H definitely got it right when they told us that eaten together, it’s their rendition of strawberry cheesecake. The Balsamic Strawberry is a breath of fresh air. It’s similar to the usual berries-based sorbets – slightly icier, sour and tangy – with the balsamic adding an interesting and unique spin. It’s still sour, but in a different way. You really have to try it to understand. I was a little apprehensive about the Salty Malty because I never got this sweet-salty thing. I do love Horlicks though, and this is by far one of the best Horlicks-ish gelatos I’ve tried. Extremely creamy, with malt being the overpowering flavour, there’s an underlying subtle saltiness that really complements the malt and rounds up every bite. Simply amazing. Thanks to this flavour I’m this close to becoming a salty-sweet dessert convert. While their gelatos are undoubtedly amazing, what truly makes M&H shine is the wonderful people behind it. The bosses have always been very welcoming, and the staff never fail to greet us with a smile. Every past visit Clarence, one of the bosses, would personally bring our waffles to us, listen to feedback on his products, and humbly accepting them. It’s this interaction and care for their customers that really makes M&H a joy to visit. 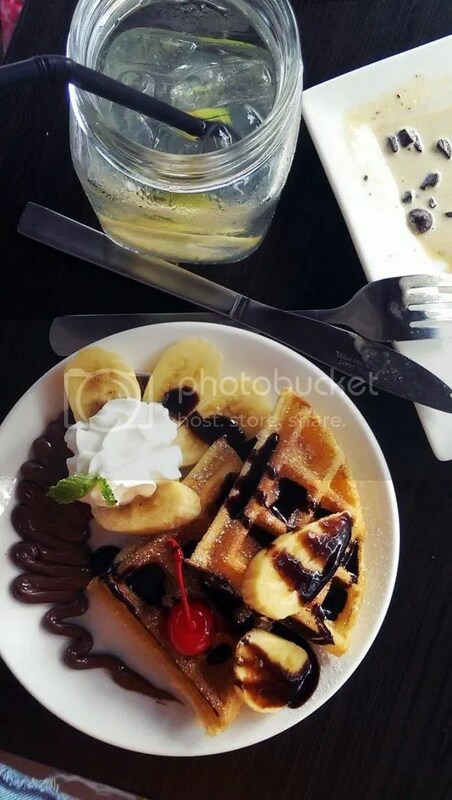 Banana and nutella waffles combi – an idea that Clarence was developing. He gave this to us for free and we gladly lapped up the chance to be his guinea pigs. 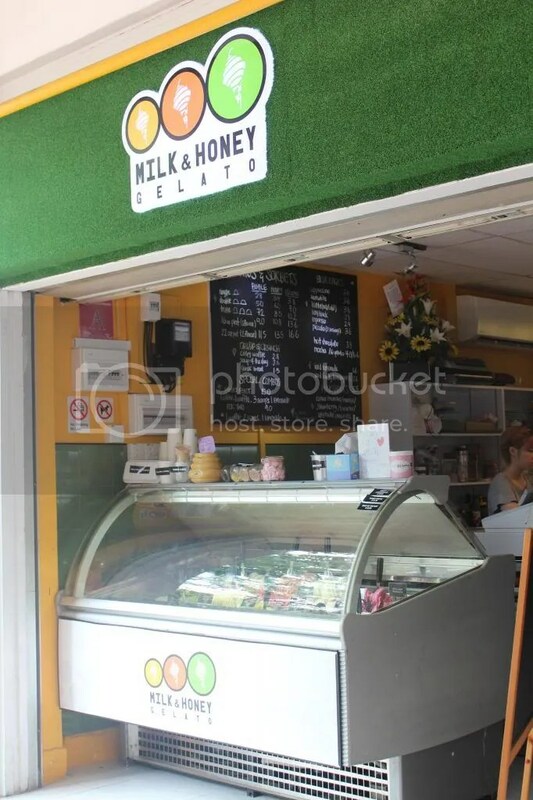 Next time you’re around the East, be sure to check out this wonderful gelataria that is Milk and Honey Gelato.